Before early 1942 the Nazis has deported a relatively small number of Jews to Auschwitz. Until mid-1942 the Poles had been the majority of the camp population with whom the first Jewish prisoners were transported. There were at least 21 Polish Jews among the first transport of more than a thousand Polish political prisoners sent to Auschwitz (June 1940) from the prisons in Tarnów and Wiśniacz Nowy. All of them died in a camp within short time. At least 1.1 million people (including 200 thousand children) who were transported to Auschwitz by the RSHA (Reich Main Security Office) were killed in the gas chambers immediately or soon after arrival. These deportees included many figures from Jewish intellectual life: scholars and artists, including, for instance, the Polish-Jewish poet and dramatist Icchak Kacenelson (Itzhak Katzenelson), author of the poem Song of the Murdered Jewish People, who was one of a group of literary figures deported in May 1944. Through the middle of July 1942, some of the transports arriving in Auschwitz were sent directly to the gas chambers. Other Jews, classified before the deportation as fit for labor, were placed in the camp. On 4th of July (1942), the Jews arriving on RHSA were introduced with regular selection. As a result, only 20% of them were kept alive and placed in the camp as capable of performing slave labor. They were mostly smployed in constructing new parts of the camp, or at German companies which were involved in maintaining and developing the military potential of the Third Reich. 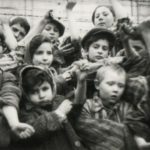 They were transferred on a mass scale from Auschwitz to sub-camps set up nearby or in Upper Siles, or to concentration camps in the Third Reich. By the second half of 1942, Jews made up a majority of the prisoner population. 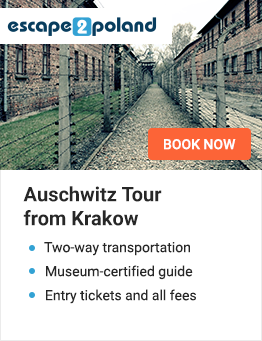 They account for more than half of the 400 thousand prisoners registered in Auschwitz. The majority of them died either while they were in Auschwitz or after transfer to other camps. Throughout the existence of the camp, the authorities there treated Jews with the most ruthless, and often quite refined, cruelty. SS men regarded a Jewish life as the least valuable out of all prisoners. To the greatest possible extent, Jews fell victim to starvation, cold, hard labor, constant harassment and abuse, and various kinds of cyclical extermination operations. Jewish prisoners suffered worse mistreatment than others during registration and in the course of the penal physical exercises called “sport.” A high proportion of Jews were sent to the penal company. As opposed to other prisoners, they were forbidden in principle to write letters or receive parcels. Very few Jews survived of the ones who arrived in Auschwitz during the early years. 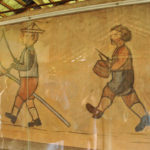 After the liquidation of the Polish state and its institutions, the main goal of German policy in occupied Poland was the exploitation of material and labor resources, and the removal of the local Polish population and ethnic minorities. This was done through expulsion and systematic extermination. The Polish lands were to be completely germanized, through German settlement in the depopulated area. The Nazi Germans regarded Sinti and Roma (Zigeuner, as they were referred to in official German documents of the period) as enemies of the Third Reich, and therefore sentenced them to isolation and extermination. In the first years after the Nazis came to power, they introduced a range of anti-Gypsy restrictions, including an obligation for them to register and submit to “racial examination”; later, they introduced limitations on freedom of movement. A commentary on the German race laws, issued in Nuremberg in September 1935, stated that the Gypsies were just as racially alien as the Jews, and therefore could not enjoy the rights of citizens of the Reich. Soon after the start of the war, the Germans decided to remove the Sinti and Roma from the terrain of the Reich. They were ordered to resettle in the General Government, where they were placed in Jewish ghettos and camps for Jews (over 5 thousand German Sinti and Roma were placed in the Łódź ghetto, and majority of them were murdered soon afterwards at Kulmhof extermination center). Finally, on 16th of December, 1942, Heinrich Himmler ordered the deportation of all remaining Sinti and Roma to a concentration camp. 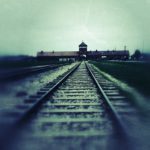 The implementing regulations for this order, issued by the RSHA on January 29, 1943, specified that Auschwitz was the place of deportation. As a result of this ruling, the Gypsy family camp known as the Zigeunerlager (Gypsy camp), which existed for almost one and a half of year, was set up in Auschwitz-Birkenau sector BIIe. The Germans began sending Soviet POWs to Auschwitz shortly after the beginning of their war against the Soviet Union (June 22, 1941). According to prisoner accounts, these transports were already appearing in Auschwitz in July. At first, the arriving POWs were usually shot in the gravel pits near the camp. Hitler issued guidelines for the treatment of Soviet prisoners in March 1941. They called for the liquidation of political commissars and communists. In spite of international conventions, they were to be killed immediately. Police operational groups—Einsatzgruppen—were supposed to seek out and kill the commissars and communists from among the soldiers. These Einsatzgruppen were set up before the attack on the USSR to “cleanse” areas near the front of “dangerous elements,” such as communists, partisans, Jews, and Gypsies. Later, the search was extended to POW camps in the depths of the Reich. Executions would take place in the nearest concentration camp. One group of about 600 Soviet POWs was brought to Auschwitz in the first days of September 1941 and taken to the cellars of block 11. About 250 Polish prisoners selected from the camp hospital were also taken there, after which SS men in gas masks dumped Zyklon B in the cellar rooms, causing the death of the POWs and prisoners there in the course of two days. This was the largest group to be murdered during the tests of Zyklon B, which was used later in the mass extermination of the Jews. During registration, they received camp numbers from a special series introduced for them. At first, these numbers were stamped on pieces of cloth, which the POWs had to sew onto their uniform blouses. 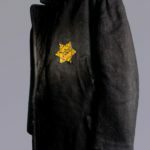 The fact that the POWs sometimes replaced their own worn-out clothing with the garments of others who died led to enormous confusion in the records. This is why the camp administration soon decided to start tattooing the numbers onto the prisoners. At first, the tattoos were applied to their left breast. A stamp fitted with sharp needles perforated the skin, and ink was rubbed into the wounds. Later, a needle attached to a penholder was used. Soviet POWs were the first prisoners in Auschwitz to be tattooed with numbers. Aside from brief mentions, the literature on the history of Auschwitz Concentration Camp does not take account of the Jehovah’s Witnesses (referred to in the camp records as Bible Researchers) who were imprisoned because of their religious convictions. These prisoners deserve closer attention because of the way they managed to hold on to their moral principles under camp conditions. This was a result of their religious convictions, based on the Bible and on opposition to all forms of violence. The period of Nazi rule in Germany and World War II represented a daunting trial for the Jehovah’s Witnesses. Everywhere constituting a small but conspicuous group, they were among the first to be imprisoned in the concentration camps. They treated their imprisonment as the fulfillment of the will of God, and therefore attempted to continue to live their lives in complete harmony with all the precepts of their faith. The ideology of the Nazi state represented a complete contradiction of their morality and everyday practices. Even rendering homage to Hitler with the greeting “Heil Hitler!” was an affront to their faith. Jehovah’s Witnesses refused to participate in military training or serve in the army. This refusal was punishable by imprisonment, or even death. They also refused categorically to perform any work that, as they saw it, contributed directly to the war effort—and, as is known, many German factories were mobilized for armaments production. As a result, many Witnesses, including women, were arrested and sent to concentration camps. Under the prisoner classification system, Jehovah’s Witnesses wore a purple triangle and an “IBV” symbol, an abbreviation for the official name of their organization in German, Internationale Bibelforscher – Vereinigung (International Association of Bible Researchers). 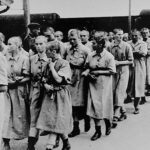 Photographs taken in the camp and kept in the Archives of the Auschwitz Birkenau State Museum show both male and female prisoners of Auschwitz-Birkenau, the former concentration camp. They were taken in a laboratory ofErkennungsdienst, which was subordinate to Politische Abteilung – the camp Gestapo. Photographs were taken by prisoners engaged to work in a photo laboratory in Block 26 Auschwitz I. The collection of prison photographs consists of 38,916 photos, including 31,969 photos of men and 6,947 photos of women. The photos were taken in three body positions: profile, en face and en face in a cap (men) or en face in a shawl (women). 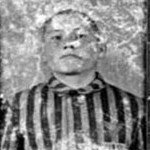 The prisoners in the photographs wear striped uniforms. Some of them wear civilian clothes. 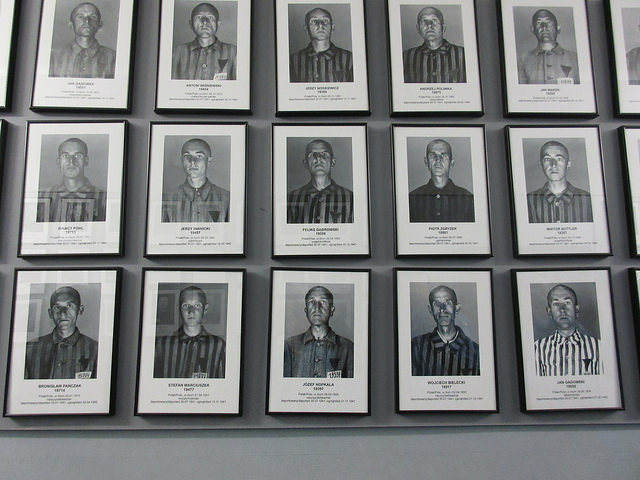 In the bottom left corner of the photographs there are respective camp numbers, nationality, the reason for which a given prisoner was in the camp and the “KL Auschwitz” reference. Visit a breathtaking online exhibition: “Before They Parished” for more pictures and stories.